It is possible to have fresh Brussels sprouts from August until the spring, but it is as a winter vegetable that they come into their own. Brussels sprouts require rich soil and a lot of space. Since only a small part of the plant is eaten – just the lateral buds formed on the thick single stem – you need a vegetable plot for a reasonable yield. However, even in a small garden, a couple of plants can provide a useful crop for Christmas dinner. Most Brussels sprout varieties are Fl hybrids. These are used by commercial growers and have been bred to produce a heavy crop of small firm sprouts that can be picked in one go. Some people still prefer more traditional open-pollinated types, either for taste or for the bigger sprouts. Even among the Fls there are differences in yield, cropping time and sprout quality. ‘Braveheart’ is a reliable, tall variety, cropping from Christmas into the spring. It was the overall favourite in a Gardening Which? taste test and has sweet sprouts. It is resistant to powdery mildew and ring spot. 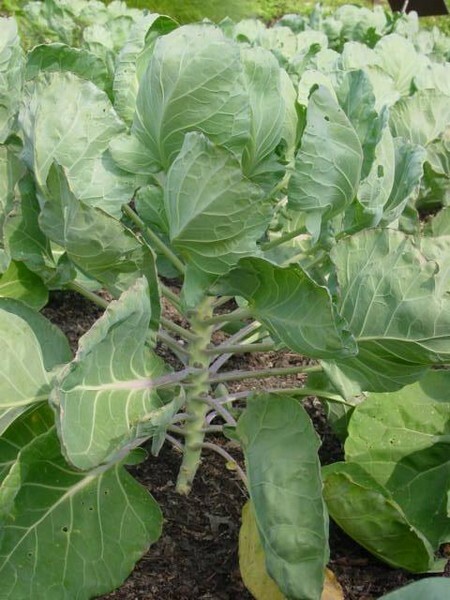 Like all brassicas, sprouts prefer a neutral or slightly alkaline soil, which makes them less prone to clubroot. Do a simple pH test early on, because if you need to apply lime, this needs to be done at least a month before adding organic matter. Sow seed from mid-March to mid-April for a winter crop. For just a few plants, sow seed in 9-cm pots. You do not need a greenhouse; the pots can be kept outside in a sheltered spot or in a coldframe. You need to keep an eye on them to make sure the compost is moist but not sodden or dry. For more than a dozen plants, it is worth using the seedbed technique to start them off. Sow seed 1.5cm deep in rows 15cm apart. Seed will germinate in 1-2 weeks. Thin the seedlings to 8cm apart or one per pot. Use a hoe to keep the weeds down and put up netting if sparrows are a problem. Dig over the ground where the sprouts will eventually be planted. Add plenty of garden compost or other well-rotted organic matter. An alternative is to grow sprouts where you last grew peas or beans, as the roots of these plants use nitrogen in the air and fix it in the soil as a nutrient. This is beneficial to crops grown in that soil the following year. There is still time to sow seed for a winter crop so long as you do it before the middle of the month. Prepare soil for planting if not yet done and leave the ground to settle. The plants will be in the ground a long time so they will need feeding. Fork or rake in l00g a sq m of growmore, then tread down soil gently before planting. Early sowings should be ready for planting out by early May; later sowings by mid-May to early June. When the seedlings are 15cm high they are ready to be moved on to their final planting site. Water the rows the day before and ease up the young plants with a trowel, taking care not to damage or dry out the roots. Dig a hole with the trowel and plant so the lower leaves are just above the soil surface. Firm down well and water them in well. Allow 50-90cm between the plants. Aim to complete planting by the beginning of this month. Keep the ground around the plants weed-free and pick off any caterpillars from the foliage. A month after planting, a fertilizer such as nitrochalk can be sprinkled on the soil surface at 35g a sq m. This adds nitrogen without lowering the pH. Water in if the weather is dry. This is also the time to draw soil around the base of late varieties or to stake plants in an exposed garden. Apply a second dose of nitrochalk and water in if the soil is dry. 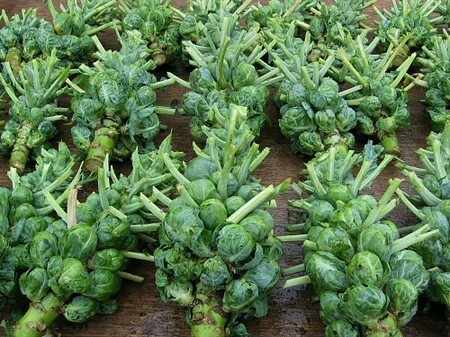 If you prefer to harvest and freeze sprouts in one go, cut off the leafy head at the top of the plant. This will encourage the sprouts to mature all at once. However, there is no reason to do this if you want to pick little and often. The leafy tops can be left and used as spring greens.